Last couple of days I am trying to get a hang on Android development. My first task is to setup the dev environment, I started with Intellij IDEA. Google considered Eclipse as their dev platform for Android. So I moved to Eclipse. Initially Android world is bit challenging as I am from .NET world. When I start working in Android, I feel comfortable. If you develop in Silverlight/WPF using MVVM then it’s not a big deal to create View and Activities in Android. I gone through one of the free ebook available for Android, now it’s time to practice what I learned. Let’s go through my first app. Listing of contacts, obviously it’s a simple one. Below is my requirement. Click event on the list should also give ID of the contact not just name. So can able to load details of the contact by querying with ID. Each contact should display with a graphics or an arrow or something. This will help me to learn binding view to ListView. I don’t have any complex View for this activity so no xml file to link here. Normally an activity will have view that has textbox, button etc. It’s a good practice to define the layout (view) in xml file and Link to Activity. I will explain that later. The above activity just list down all the contacts, so I inherited from ListActivity. As you can see I override onCreate method. This method will execute when activity get created. First thing I did in onCreate is get a list of contacts. Ignore where I created getContacts(), anyway it’s a test project so leave it. In getContacts() you can see ContactList and Contact those two are domain class. Rest of the things are easy to understand if you have some knowledge in Android. If you are new to Android world better go through the book I mentioned at the begning of this post. getContacts() return ContactList object contains list of Contacts. 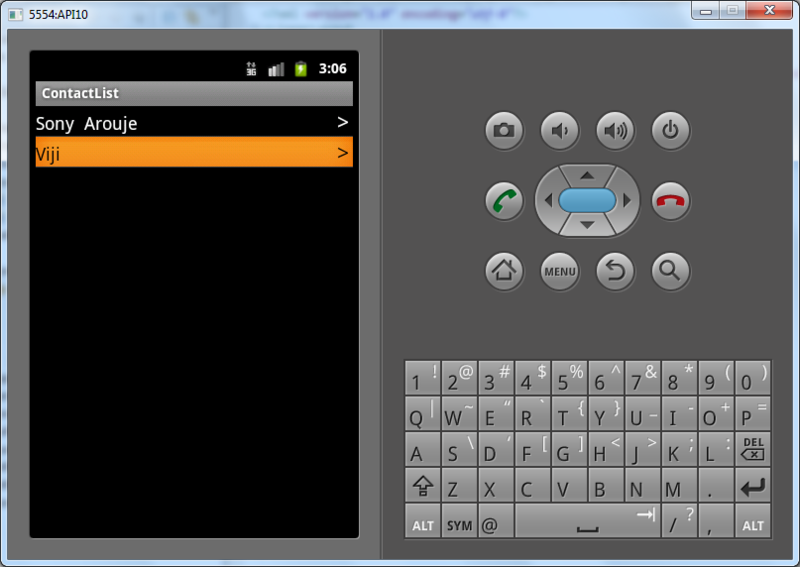 Next step is to bind the Contacts to ListView. Android uses Adapters to bind any kind of list to items control. Here in this case I am not just binding a string array, I am going to bind a view. So I created new Adapter extends from ArrayAdapter called ContactAdapter. As you can see in Line#8, I mentioned the View. So this adapter uses the specified view and bind it to ListView. You can find more about LayoutInflater here. contactlistitem is an xml file and I defined in Layout folder. R.* is an auto generated file contains the index to different stuffs in the project like Layout, controld identifier, etc. Note: To create contacts in emulator you need to specify Virtual SD Card size say 200 Mib while creating the AVD through Android SDK and AVD Manager. I am not sure what kind of error your getting. The one I uploaded is working for me, I havent got any errors. Pls check whether you added any contacts to simulator, also verify whether you specified the virtual SD card size. sir, m adding the contacts in emulator…i have got error in contact…………. Still u haven’t mentioned the details of the error. Please debug the code and find out what exactly the error is. Just saying ‘Error in contact’ will not help any one to figure out the issue. I have the same problem with “Contact”, can you please tell me how to solve this problem. I tested this code in a simulator, I am not doing much in Android world now. You can add a debugger or logger and check the error. I did this experiment very long ago and lost the touch with Android dev. Your app’s running perfectly. I’m a beginner in Android and I needed such an app to learn from and work on. Thanks! I am happy that you like my post and it helped you. Unfortunately I am not doing much in Android these days and I don’t think I will be able to answer your question. I am really sorry ssd. Hello, I have a problem. What is ContactList??? Contact list = phone book in your mobile.